Missouri State Representative Rick Brattin has introduced a bill that would eliminate tenure at public universities in the state. The text of the bill can be found here. This follows on the heels of a similar bill that has been introduced in Iowa. The Missouri bill would also require universities to provide information about the costs of different degrees and the job prospects for people with those degrees. That bit actually sounds okay to me. Job opportunities and future earnings are not the only things you should consider when making decisions about your education, and I firmly believe that a good education, particularly in some of the less lucrative fields, can enrich your life in ways that don’t translate financially. However, allowing students to make an informed choice seems good, particularly for those students who may not have the family financial resources to fund an education that won’t lead to a decent career. Q. Are you concerned that eliminating tenure would damage academic freedom, or professors could get fired for political reasons? A. Like I said, in what area do you have protection of your job for whatever you say, whatever you do, you’re protected? You don’t have that. Their job is to educate, to ensure that students are able to propel themselves into a work force and be successful. That’s their job. If they are going off the rails and not doing what they are supposed to as a hired staff of educating those kids, should they not be held accountable? Should they have the freedom to do whatever they wish on the taxpayers’ dime and on the students’ dime? That should be more the question: Should they have that freedom to do that? Their focus should be to ensure that we have an educated person to be able to succeed beyond their wildest dreams. If you’re thinking of taking a job in Missouri, you’ve got a brief window. The Chronicle states that the bill would not apply to anyone receiving tenure before January 1, 2018. The text of the bill actually says that it would not apply to anyone hired before January 1, 2018. So, if you started a position there this fall, you’d maybe be okay? Or maybe it won’t pass! If you live in Missouri, call your state representatives (when you take a break from calling your federal representatives). Ronin Institute Research Scholar Brent Ranalli has had two articles published recently in the Thoreau Society Bulletin. Both also appear on the Society’s blog. 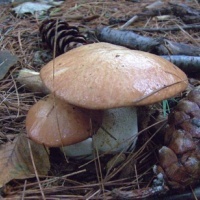 The first, co-authored with naturalist Cherrie Corey, seeks to identify the mystery mushroom that Henry David Thoreau describes in his journals as resembling a traditional New England “election cake.” The second uses literary sources to reconstruct Thoreau’s walking gait and asks what the gait reveals about the man.